John Rogers, PhD, the Louis Simpson and Kimberly Querrey Professor of Materials Science and Engineering, Biomedical Engineering and Neurological Surgery, is the designer of the wearable microfluidic sweat analytics system. Northwestern University professor John Rogers, PhD, Neurological Surgery and at the McCormick School of Engineering, is collaborating with a broad collection of partners including Gatorade, the Seattle Mariners, the U.S. Air Force and the Shirley Ryan AbilityLab to bring his wearable microfluidic sweat analytics system into widespread distribution. The device measures sweat and sweat biomarkers accurately and in real time, allowing athletes, military personnel, fitness pros and others to monitor sweat rate and electrolyte loss, so they can keep hydrated, replenish their electrolytes and stay on top of their game. The partnerships are aimed at further developing, testing and validating Rogers’ device, which monitors sweat loss and analyzes sweat chemistry with a simple, real-time visual readout. Previously developed in Rogers’ Northwestern Engineering laboratory, the soft, flexible device sits on the skin and measures sweat to determine how the body responds to exercise. 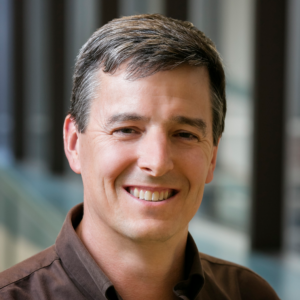 Launched from Rogers’ group through Northwestern’s Innovation and New Ventures Office (INVO), the startup Epicore Biosystems has established large volume manufacturing capabilities for these microfluidic devices. It also has plans to co-package them with nutritional, skin health, cosmetics and sports hydration products, with additional possibilities for use in clinical medicine and rehabilitation. “The Gatorade Sports Sciences Institute knows a great deal about sweat, and they have very rigorous testing protocols for evaluating new technologies in this space,” said Rogers, the Louis Simpson and Kimberly Querrey Professor of Materials Science and Engineering, Biomedical Engineering and Neurological Surgery in McCormick and Northwestern University Feinberg School of Medicine, and director of the Center for Bio-Integrated Electronics (CBIE). Initially introduced in 2016, Rogers’ microfluidic design has come a long way in the past year. Earlier designs measured chloride loss, glucose, lactate and pH levels in sweat. Newer platforms also quantify concentrations of heavy metals such as lead and arsenic and urea and creatinine levels, the latter of which relates to kidney health. The latest devices can also measure these chemistries continuously, in real time, allowing wearers to monitor how their sweat chemistry changes during an exercise regimen and throughout the day. Even better: The athlete does not need to pause his or her workout in order to decipher complicated information. Instead, he or she can monitor these sequentially changing levels with a simple glance. During exercise, sweat winds its way through the device’s microscopic channels and into different compartments. In those compartments, reactions with chemical reagents result in visible color changes that quantitatively relate to electrolyte concentrations. Co-authored with scientists at the Gatorade Sports Science Institute, the study was published online in the journal Science Advances. Rogers is also presenting the work as a part of his talk on bio-integrated technologies at the American Association for the Advancement of Science (AAAS) annual meeting in Austin, Texas, discussing how his technology can be used to aid rehabilitating stroke victims. Another unique feature of these latest platforms is their ability to measure users’ sweat during aquatic sports, even when fully underwater. 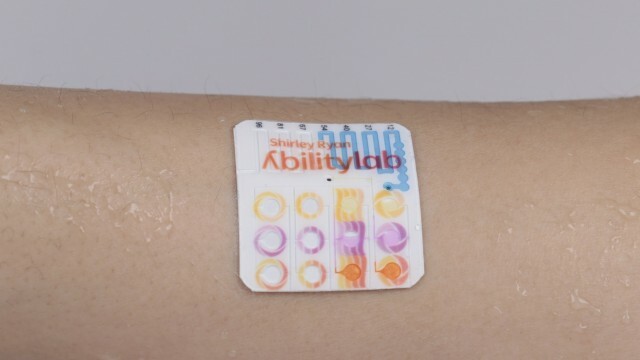 New adhesive materials and microfluidic designs maintain water-tight seals to the skin to capture and analyze sweat while preventing surrounding water from entering the device’s microscopic channels. The systems were first deployed on triathletes and are now routinely used by Northwestern’s swimming team. Through Epicore Biosystems and the CBIE, devices are now in widespread deployment with a broad range of different organizations. The Seattle Mariners are using hundreds of the devices to track players during spring training. Active duty airmen at the Wright-Patterson Air Force Base in Dayton, Ohio are also using the devices. Patients are also using the devices at the Shirley Ryan AbilityLab, one of the nation’s top translational research hospitals. Scientists there are exploring left/right asymmetries in sweating as a metric for recovery in stroke patients. The devices also help clinicians monitor differences in patients’ sweat chemistry over the course of the rehabilitation process. With the technology on track for commercialization, Rogers’ team, including Roozbeh Ghaffari, PhD, the director of translational science at CBIE, is continuing to test the microfluidic devices in scaled studies with an expanding collection of partners. Rogers anticipates that a version of this technology could be in the hands of military personnel, sports teams and consumers in the next year due in large part to the simple, low-cost nature of the technology and its broad appeal to end users. “Joining forces with science-driven organizations such as the U.S. Air Force and Gatorade will help us to deliver on a new class of wearable technology — one that provides quantitative information on sweat, with the potential to fundamentally change the way that people manage their hydration, health and performance,” Ghaffari said.